Hello? Anyone still out there? I’m not dead… just been busy running a food truck. So as you can imagine my time has been spent smelling like a fryer, driving a beast of a truck, and rolling lumpia to the point where I think I’m becoming a lumpia. I just haven’t had much time to share delicious adventures with sweets. But have no fear – it’s a new year and I plan on blogging more. On that note, I’d like to share with you about my unrelenting love for donuts! 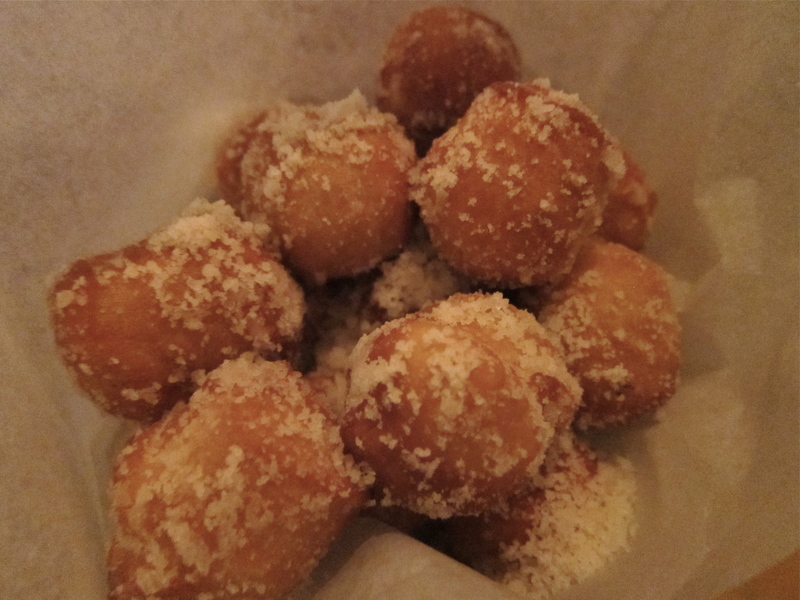 On my last trip to Denver with R, we decided to spend the entire weekend in search of these delectable fried delights. I see some of you rolling your eyes back there, but hear me out. I know you may think donuts are so 2009 – and I’m sure everyone is tired of hearing about maple bacon donuts – but for me this is beyond a fading trend. I am absolutely, whole-heartedly besotted with donuts. What’s not to love? It’s dough. It’s fried. It’s sweet. Done! My journey can be broken down into three categories of donut shops. LaMar’s is a Denver staple. It wasn’t hard to find this shop since there are plenty of them scattered throughout the city. After talking to a few locals, it was evident that Denver loves LaMar’s. 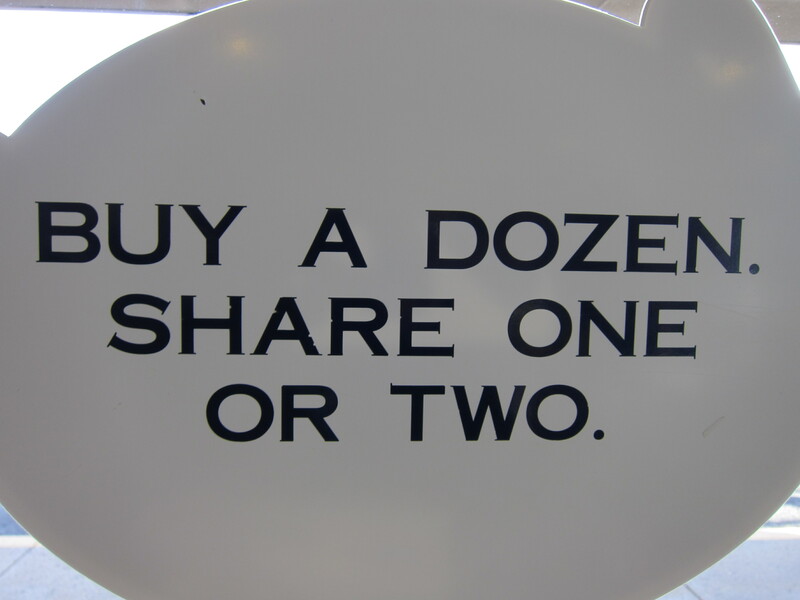 LaMar’s has a large variety of donuts to choose from. Upon inspection I noticed that most of the donuts seemed to be of the old fashioned cake donut variety. While I do enjoy a good cake donut (it is cakey afterall) I prefer the fluffier fried variety. R on the other hand was in heaven preferring the dense delicious cake donut over the others. We decided to get a half dozen to fully enjoy the spectrum of offerings. We ordered a blueberry cake donut, a german chocolate cake donut, a red velvet cake donut, a pumpkin cream cheese cake donut, an apple spice donut and an original glazed. The cake donuts were dense, moist, and packed full of flavor, exept the red velvet which was a dry crumbly mess of a thing. My favorite of the cake donuts was the apple spice cake: bursts of cinnamon, juicy apple sweetness and a perfectly spongy texture. 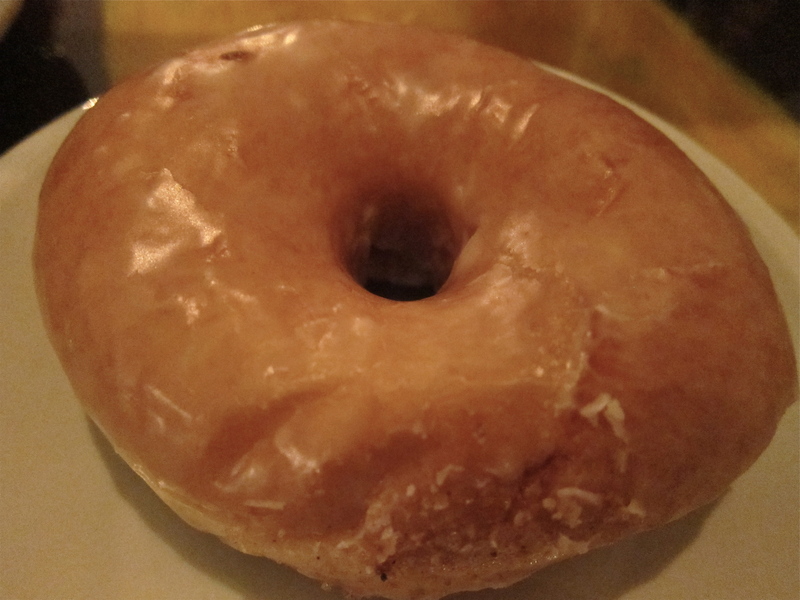 The original glazed was everything I love about a good glazed donut. The glaze gently cracks with each bite revealing the soft semi-sweet dough below. All in all I can see how LaMar’s is Denver’s perfect daily donut joint. I only wish LA had something similar. 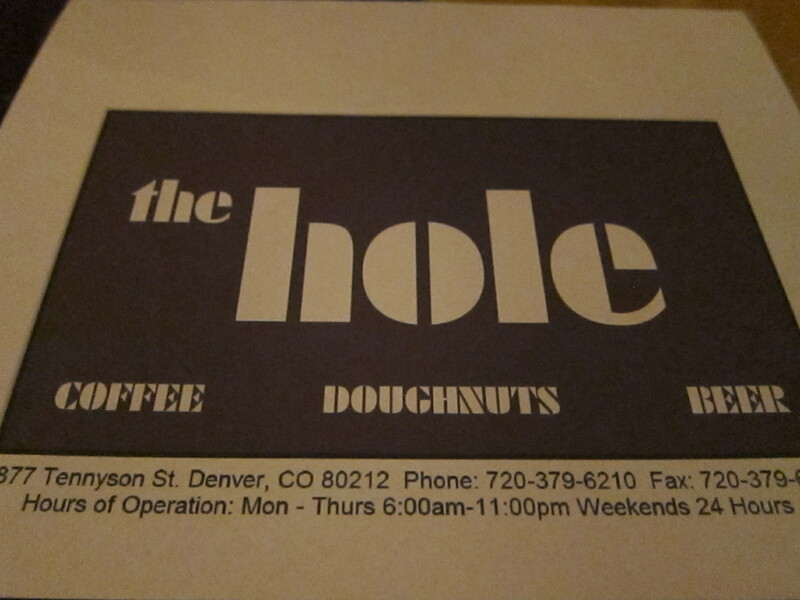 When doing our research for donuts around Denver we came upon The Hole. A newer establishment in the hip, fun Highlands neighboorhood, The Hole is a beer and donuts joint ( yeah I know, awesome right?) They are open 24 hours on Fridays and Saturdays. While their menu isn’t limited to beer and donuts, those are the focus. This isn’t necessarily the type of donut shop you would go to on your way to work like LaMar’s, but unlike LaMar’s it is a great place to hang out with friends or to satisfy a late night sweet tooth craving. 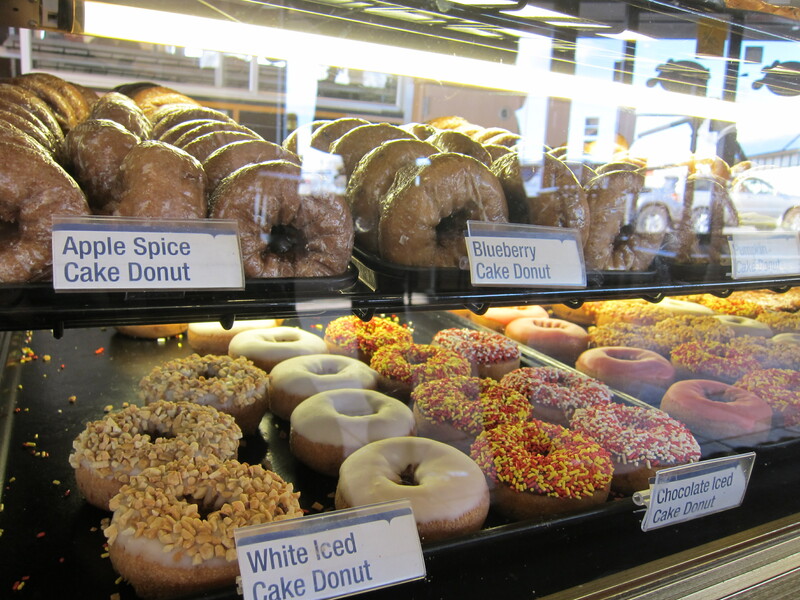 They have a full counter display of freshly baked donuts in addition to their specialty donut offerings. Their flavors are anything but ordinary. Their elaborate inventions range from amaretto donuts and elvis donuts to pizza and churro donut bites. With so many mouth-watering options it was hard not ordering the whole menu. We started from the menu and ordered the salted toffee bites. They are served in a paper cone sprinkled with salty toffee. They come to the table hot and fresh from the fryer. We popped these salty sweet bites one after the other without blinking, but then we realized while we loved their hot doughy texture, we found the salted toffee flavor to be missing. There was a sugary salty sprinkle on the bites, but that was about it. 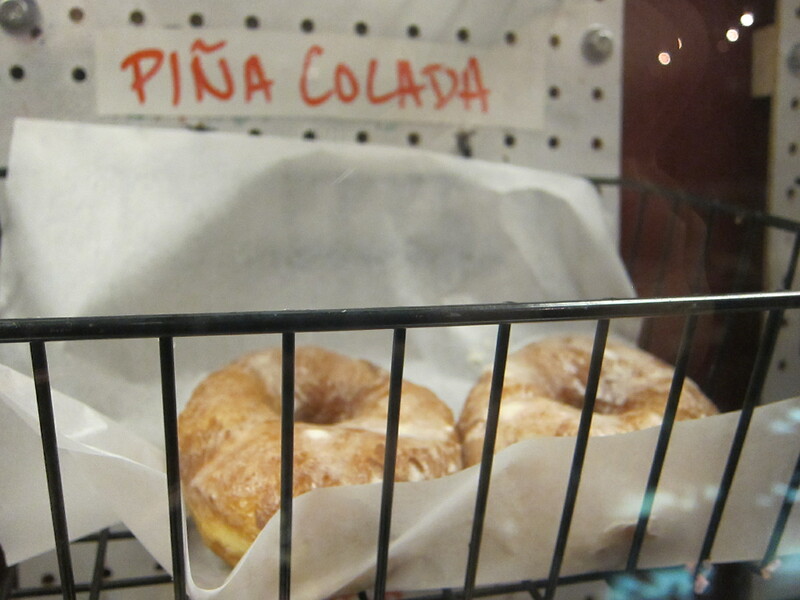 Next we ordered from their selection of daily fresh donuts at the front counter. It was tough to narrow down only two donuts among so many, but now I have a reason to come back (the pina colada is calling my name). We ordered the Elvis donut and a lemon rosemary. Again, these donuts had the perfect texture. Nicely fried, not oily, and ribbons of dough that fold so softly and sweetly together. The lemon rosemary had a flavor profile that was a little too subtle for me. I expected a tart tangy lemon bite balanced with a verdant floral rosemary burst, but instead the flavors were flat. 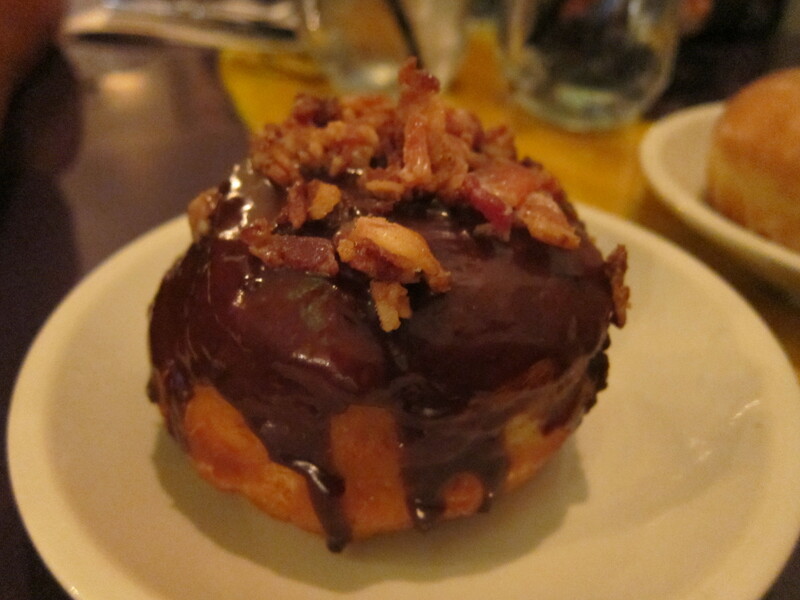 The Elvis on the other hand is a donut worth dreaming about! 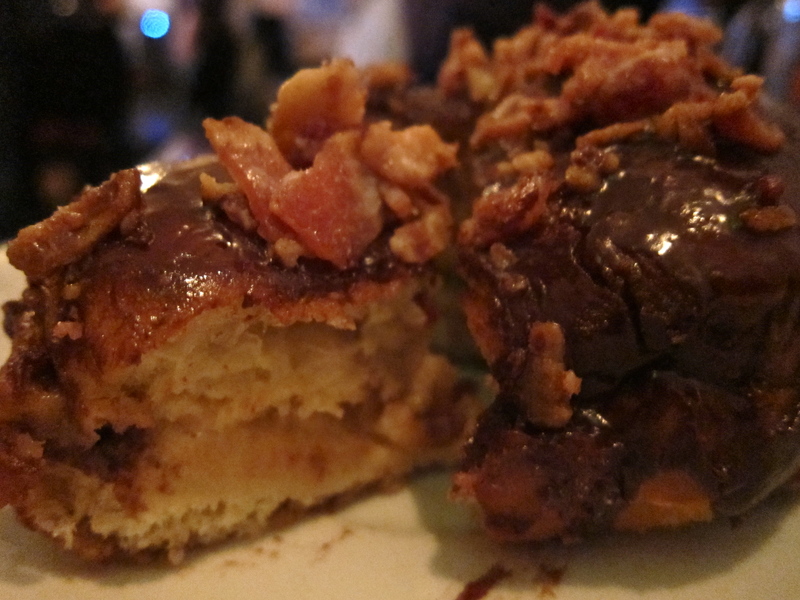 Thick and rich, it is filled with ooey gooey banana, coated in chocolate and sprinkled with crispy salty bacon. All of these ingredients formed the most harmonious marriage. The banana folds into the yielding dough, both enrobed in chocolate that adds bitter sweetness. The sweet notes are rounded out by the bacon which provides a salty, savory, meaty depth. I could have easily consumed 10 of these they were so addictively good. Table 6 is a well known eatery in Denver. It is a favorite among locals and visiting foodies. Table 6 offers a convivial American bistro style that has patrons coming back for more. R and I were full off of donuts already so did not have a chance to enjoy their full menu, but full or not we came for donuts. 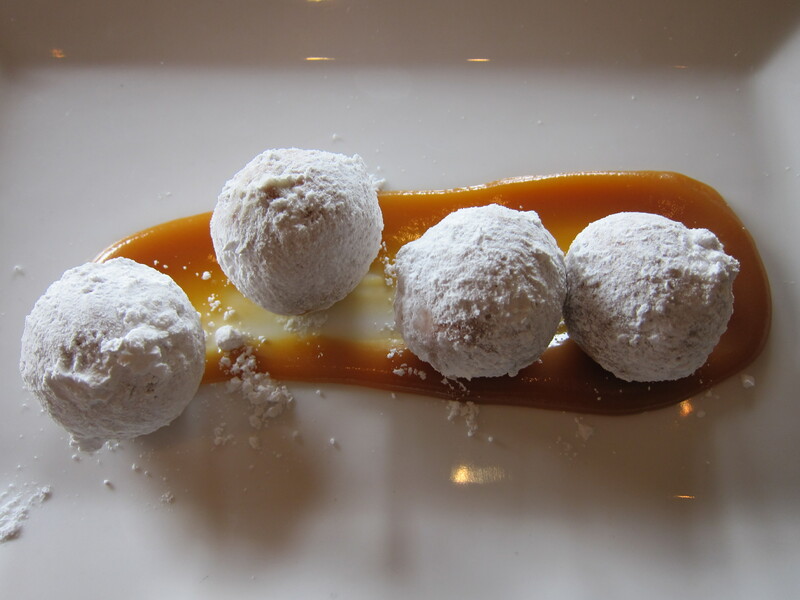 The donuts at Table 6 are what I’m going to call the “fancy gourmet donut:” chocolate beignets. You have probably seen a version of these before on the dessert menu at many fine dining restaurants. 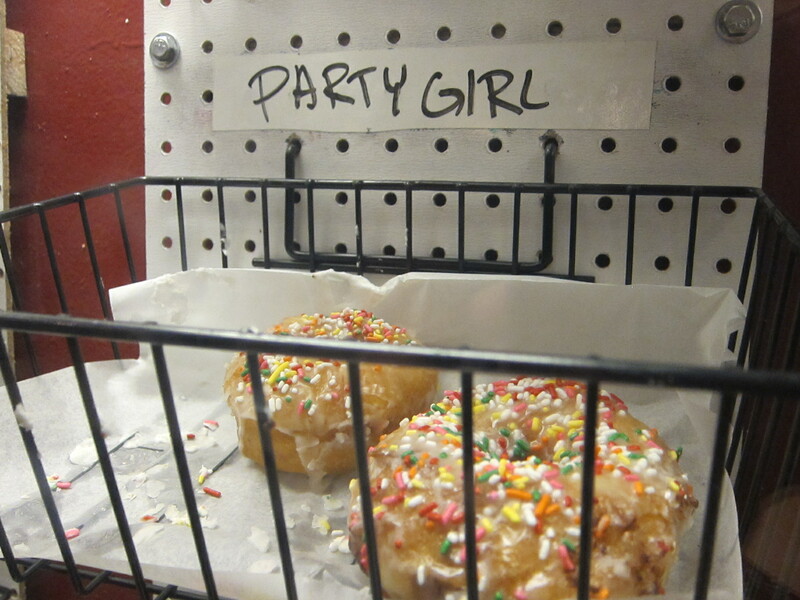 However, these are anything but your ordinary gourmet $9 order of donuts. 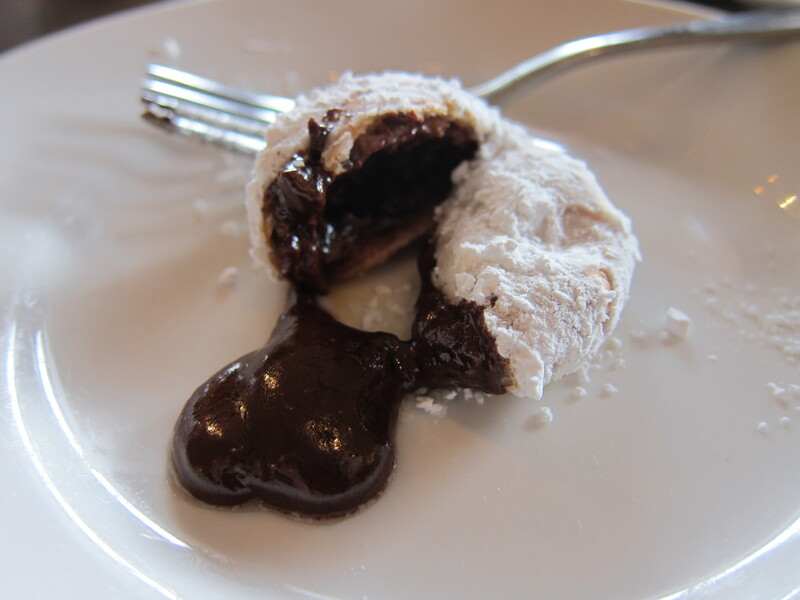 The chocolate beignet provided a fried shell of a donut covered in powdered sugar that gently collapses to reveal liquid chocolate heaven hiding inside. There was a passionfruit syrup spread across the plate upon which the beignets sat. 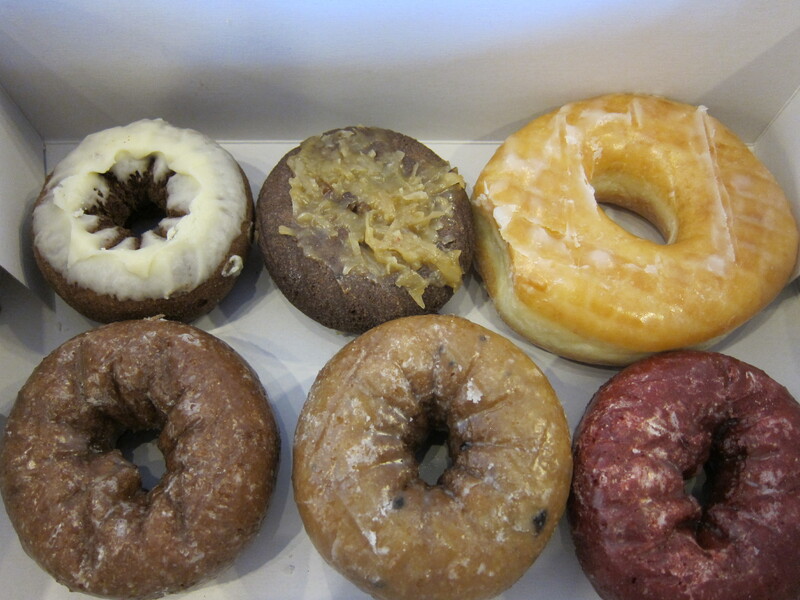 The lovely contrast of citrusy tang with the oh-so-decadent melted chocolate inside each donut was divine. It is a very small order, but these lovelies are so rich you only need a bite to fully enjoy. While this was a great start for my donut hunt, I can’t wait to go back and try Il Posto for their famed Italian donuts and the Sugar Lips food truck for their donut holes. Mmmm deep fried sugary heaven! Next PostNext Daily Dose of Donut! I am SO FRIGGIN READY for a doughnut renaissance in LA! Bummer that the red velvet donut wasn’t tastier! so excited to find your blog, and even more excited to try your food truck! Wow, that last pic is amazing!! i could really go for an elvis donut right now! why isn’t there a HOLE in LA?!? I just ate a donut burger w bacon a cheese. At my local fair. Yes I did 😉 it wasent that bad…. Donut even know what will happen tomorrow either. Just so many nerves..